Operations Management is basically the "planning, organising and control of all the resources and activities to provide goods and services" . It takes place in each organisation (factories, offices, etc) and includes numerous disciplines such as Human Resources Management, Quality Management or Labour Organisation. 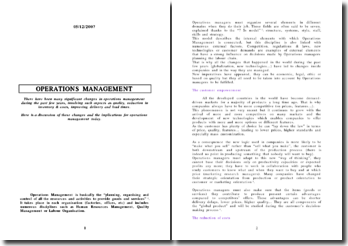 Operations managers must organize several elements in different domains when they do their job. These fields are often said to be seven, explained thanks to the "7 Ss model" : structure, systems, style, staff, skills and strategy. This model describes the internal elements with which Operations Management is connected, but this discipline is also linked with numerous external factors. Competition, regulations & laws, new technologies or customer demands are examples of external elements that have a strong influence on decisions made by Operations managers planning the labour chain. That is why all the changes that happened in the world during the past few years (globalization, new technologies...) have led to changes inside companies and in the way they are managed. New imperatives have appeared, they can be economic, legal, ethic or based on quality but they all need to be taken into account by Operations managers to be fulfilled.